My Glass House: Pecked Off Her Nose! Reading is a big deal in my home. I love to read. I love the written word. The way the cover feels rested in my hands. The way the pages sound and smell as they are turned. Probably why even though I understand e-readers (smart inventions for traveling readers), I still long to buy tangible books. I don't buy a lot of adult books anymore since e-readers and e-books are available. I do still buy children's books though. I want my children to enjoy the tangibility, the feel, the smell and the joy of a book. The same joy I grew up holding dear to me. In the beginning I used to read to my children twice a day. At nap time and bed time. Then, I did this when A was old enough to enjoy books. Only I read to her alone in her room, and then read to E alone in his room right after. The time was good, but soon, they wanted to hear the same stories. Soon, I became tired and bored with spending over half an hour at bedtime reading to each child. Nap times were extended in time to get ready and shortened in the time spent napping. It was a mess for all involved. Now, reading is only once a day. Our new ritual is for each of my three littles to grab a book of their choosing (sometimes mommy chooses), and we all curl up in mommy and daddy's bed and read to everyone. Sometimes, when there is time, the littles tell me one of their own made up stories. It's really cute to hear them use their imaginations. In my search for new books for my word thirsty children, I came across a wonderful book containing nursery rhymes and other short stories. My children love this book as do I. The one story they want to hear before anything else is "Sing a Song of Sixpence". Every night I curl up with them and this book, they shout. "Pecked off her nose, Mom! Pecked off her nose!" Ah my silly children. And every time, at the end, I tweek their little noses, as they shower me with giggles and requests to sing it again. 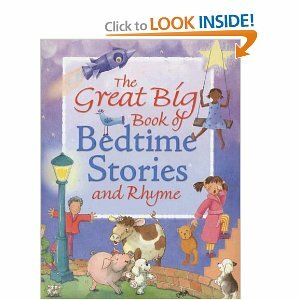 What is your favourite book or rhyme to read to your little?